Inder Loves Folk Art: Vintage Singer Buttonholer. Look what I got on eBay for only $7.49! 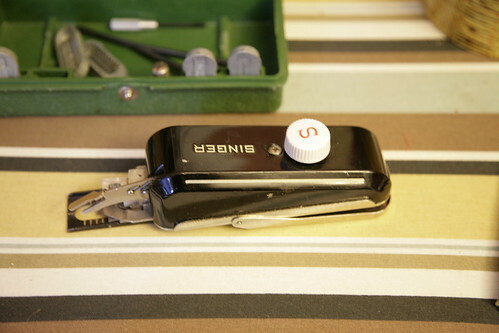 A vintage Singer buttonholer attachment! I hear that these things make beautiful buttonholes, and I am sorely in need of beautiful buttonholes, let me tell you. How does it work? Great question! I have no absolutely earthly idea. Do you? Thanks! Well, I spent last night fiddling with it and doing internet research, and determined that it is a "low shank" model and of course, I need a "slant shank" model. Drat. I also figured out that it's probably worth more than $7.50 if I want to resell it, though! And of course, I bought the model that will work for my machine, which comes in a space-aged pink bullet case, for $25. Because having watched 5 million tutorials on the internet, now I "need" one, of course. 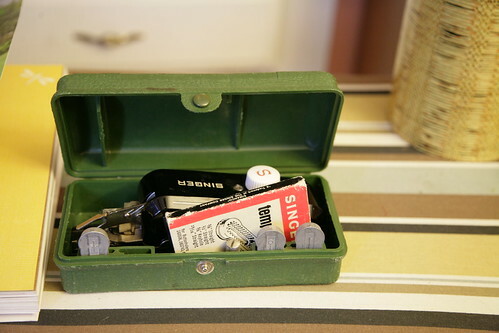 my mom totally has one of these lying around that goes with her sewing machines (which was her mom's). btw i thought of you this past weekend when i was in portland and in thrift stores and there was TONS of vintage pyrex. i didn't buy any, but i strongly considered it.